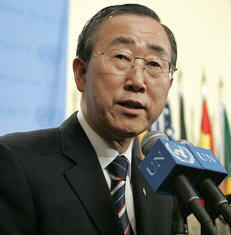 Secretary-General Ban Ki-moon has condemned the shooting attack on a United Nations helicopter on Thursday in Dongo in western Democratic Republic of the Congo (DRC) that left three peacekeepers, a civilian pilot and one member of the Congolese national police wounded. Personnel with the UN Mission in DRC, known as MONUC, have been tasked with assisting the Government to protect civilians affected by the violent clashes in the village of Dongo in Equateur province that have displaced tens of thousands of civilians, and left scores of villagers and policemen dead since late October. “The Secretary-General calls on the Government of the DRC to ensure that the perpetrators of the attack against MONUC are held accountable,” his spokesperson said in a statement. Mr. Ban also encouraged the Government to take steps to peacefully resolve the issues underlying these clashes, and pledged MONUC's assistance in this regard. The fighting, thought to be over disputes based on farming and fishing rights in Dongo, have not only displaced an estimated 14,000 people inside DRC, but have also sent over 38,000 people fleeing into neighbouring Republic of Congo.